Image caption Despite being produced in Buckley, the brick says "Made in England"
Mystery surrounds the history of a Flintshire-made brick discovered in a shipwreck off the Sri Lankan coast. Diver Ravana Wijeyeratne, who found the Buckley brick, believes the wreck could be a naval ship accompanying HMS Hermes, which the Japanese sunk in 1942. But historian David Sallery believes it could be from an older vessel. Mr Wijeyeratne said he left more bricks in the wreck so other divers "have something to see". He contacted the Buckley Society to try and find out more about the brick's origin. He wrote: "We got it from the ship's boiler. "There is a lot more, but we just took one as we want other divers to have something to see." He speculated that it was possibly a "navy ship as these all went down with the Hermes". "This was one of the many ships the British evacuated from Trincomalee harbour on news of Japanese air attack," he added. "Unfortunately, they also knew of this retreat and followed the vessels to bomb them - south of Trincomalee near Baticaloa." However, Prestatyn-based David Sallery, who runs historical website Penmorfa, said: "As the bricks found were firebricks this would imply that the ship would have been coal-fired. "All navy ships had, by World War II, been oil-fired for many years and the only coal-fired ships would have been cargo ships, and pretty old ones at that. "Even in 1940 a coal-fired ship would have been pretty rare. "So my guess is that the brick came from a ship which had sunk probably before the war started." After 70 years on the sea bed, the brick is discoloured and barnacle-encrusted. 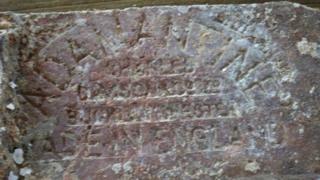 Although the town is in Flintshire, the brick carries the words "Buckley, Chester," as well as "Made in England." Paul Davies, secretary of the Buckley Society, said: "Buckley Bricks were in demand all over the world. "During the Industrial Revolution many industrial processes were developed using steam power. "The fire-resistant quality of Buckley brick was unrivalled and demand was high for bricks and blocks for lining and supporting boilers."